It’s officially fall, so food bloggers around the world rejoice – we can share pumpkin recipes again! Let’s kick off the season with a recipe I’ve been loving lately, this Turmeric Chai Pumpkin Bread. Packed with antioxidants, this is the perfect breakfast loaf or snack cake to have around the house! If there’s one spice I can’t live without, it’s turmeric. As you can see below, my recipes don’t lie and I’ve put turmeric and everything from smoothies to soups: Glowing Turmeric Soup, Tahini Turmeric Salad Dressing, Turmeric White Hot Chocolate, Spiced Turmeric Milk, and these Lemon Mango Turmeric Smoothies. There’s just something about the gorgeously intense color, the deep flavor, and overall – the great health benefits, that keep me adding turmeric to my every day life. It was obvious that it needed to come into the baking department when I realized that pumpkin and turmeric go hand in hand! It’s packed with antioxidants in the forms of A, C, and E, along with zinc, all of which are great for your body. Add the turmeric and this is basically a health recipe (which it totally is if you substitute the sugar for coconut sugar or maple syrup – if you try it, leave a comment and let me know how it goes!). For this particular recipe, I used what I had in my pantry which was the Numi Organic Tea Turmeric Chai Golden Latte powder. It’s a blend of delicious fall spices along with turmeric and black pepper (helps activate the properties of turmeric root), so it’s an easy add-in. If you can’t find this, you can make your own blend by mixing powdered turmeric with ginger, cloves, cinnamon and cardamom. It’s like the big brother to my Autumn Spice Blend! Bake up a double batch of this bread and share with friends this season – go on and bake. 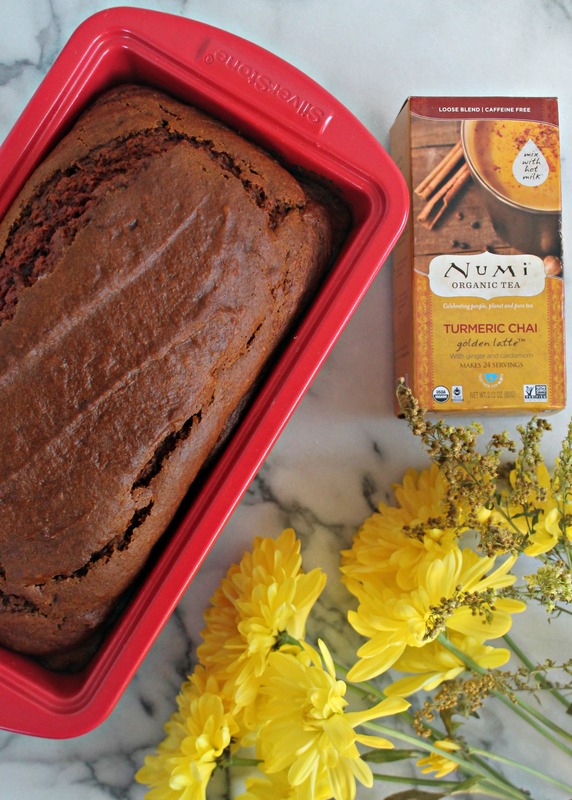 This Turmeric Chai Pumpkin Bread is perfect for breakfast or even as a late night snack - the warm flavors will have you dreaming of crisp fall days! Preheat the oven to 350F and grease a loaf pan. Set aside. In a large bowl, whisk the pumpkin puree, oil, eggs, and sugar. In a separate bowl, mix all the dry ingredients and then add to the wet ingredients. Mix until incorporated. Pour batter into prepared pan and bake for 35-45 minutes, until golden brown and toothpick comes out clean.